Sometimes, we need to establish the end of a line at a location measured form something else rather than the first point. 1. 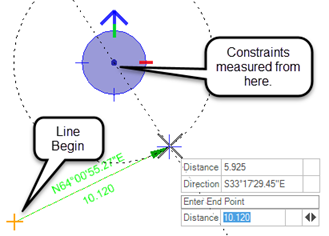 Start the Horizontal Geometry Line Between Points command. After setting the first point, reposition the cursor by clicking the Set Origin shortcut. 2. Then click or snap somewhere else in the screen to define the position of the compass. 3. Tab between the dialog fields to define the location of the second point. 4. Reset to dismiss the Line Between Points command. Contact us for training solutions for Civil AccuDraw and OpenRoads.